Warm greetings from this great land known as the Awakening Forest - Aranya Bodhi. Driving in the other night, we stopped at the creek and i stood in awe beneath the depth of the darkness of the sky, twinkling starlight penetrating the heart amidst the vast grandeur of the forest rising around up to touch the sky. We then drove up and then down the short and gently curving road until coming upon the site of a yurt glowing with candlelight amidst the trees in the distance. There was a feeling of meditative peace that touched us from the yurt, and of the light of the Dhamma in the space and hearts of those gathered. Walking down, the door opened, candlit interior revealing a reflectively glowing image of the Buddha, and the robed forms sitting peacefully and quietly within, united in that space. Bodies moved to greet, bright, kindly and knowing eyes twinkling in the candlelight, gentle touch guiding within. It is so good to be a part of this. After so long being a solitary bhikkhuni, or then one of a very few scattered bhikkhunis within the Theravada, it is so good to be welcomed into such a space -- to be welcomed into this community. It is hard to say which is more precious -- the treasure of this space to practice here in nature on this great land, or the treasure of the opportunity to practice together as sangha, with shared intention for Nibbana, our steps on the Path, joined together, in mutual support. Either is great. And the two coming together is a kind of rare and precious combination that seems it must have taken lifetimes to manifest. And here it is now: this Path, this opportunity. As sunlight touched on the bows of trees early in the morning, standing on the deck of Freedom Kuti, i saw that the forest has grown, new growth glowing softly like a halo. 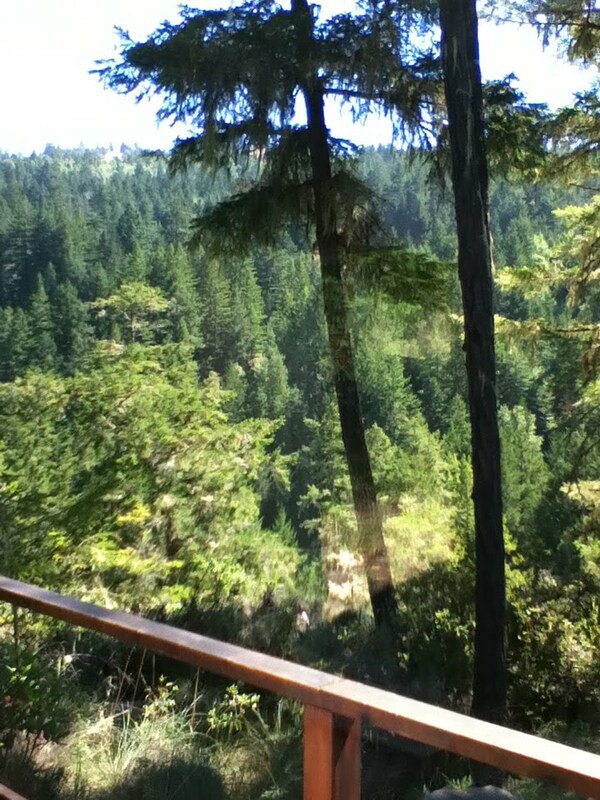 All of the trees are taller now, by one to three feet. 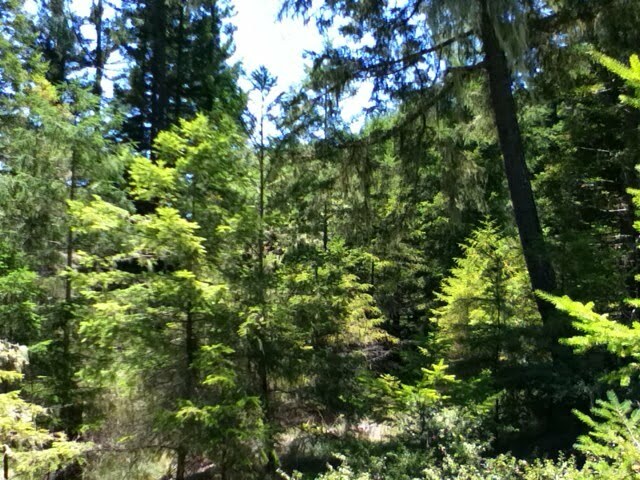 The entire forest has grown and is more mature now. It was an ancient forest, with trees and rare, native plants many hundred years old. And then the forest was cut down - logged. Thanks to the friend who purchased this land near three decades ago, it has been held lovingly, and allowed to grow back, with a dedication not to log it again. A haven for meditators. I feel the preciousness of this offering to our world, our planet -- the offering of the regrowth of the ancient forest. And out of the stumps, sharing the ancient roots, a fairy ring forest has emerged. The new trees -- heart and root shared with the originals -- have grown up in reverential circles gathered around the remains of the old, still visible. And now it is growing tall again. Rising moment by moment, significant growth and maturity each year. I feel a kinship and a commonality between these trees and our reviving Theravada Bhikkhuni Sangha. In fact, the Buddha himself was spoken of as a great tree -- a place of refuge and of nutriment for many living beings. And he in turn spoke of Mahapajapati Gotami -- known as foundress of the Bhikkhuni Sangha -- as also one of these great trees. Not only she, but many of his great disciples, the Arahant Sangha -- which were also called Great Trees and the Great Forest. The ancient people believed deeply, mythically, spiritually, in the importance of these trees. For life on our world, and wisdom. I feel a great honor and reverence for what the forest means to our world, our human world, our embodiment, this place, this incarnation, for the Path of Awakening. And such a great honor and reverence for those who live so dedicated. Let us protect, and cherish, and conserve this well. Not in an attached way, but knowing the wisdom of it. Our destinies are all interconnected, intertwined -- ourselves, our becoming harmless and the freeing of our hearts -- with all forms of life and existence. Please join us in this special time of practice, in this special dedication, in any and every way you can. The root of the Dhamma is the root of our life, the heartwood of the Dhamma and the sap that flows in it, the heart and blood of our life. We can feel and know and realize this in ourselves, in our bodies and minds. Realizing this, we awaken. The ancient trees that we are become aware -- buddha -- that life flows within us, and we connect to the timeless -- akalika, the Deathless -- amrita, Dhamma.